Guess what day it is today? Okay, you can already guess from the title and the pictures. 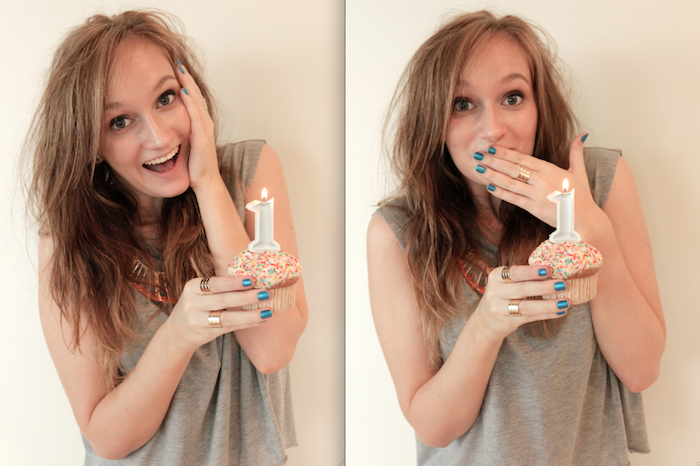 It's my blogs first birthday! Yep that's right. This little space here on the internet is officially one year old. Wow. So to celebrate I thought I'd eat a cupcake (well that and) write a post to thank you guys. It's still quiet surreal that you- that people from all over the world-read my blog. It's even harder to get my head around the fact that some of you actually want to see more and keep up to date by following me. Regardless of whether you're a first time reader or a long time follower, I just wanted to thank you for stopping by. Of all the places on the internet you chose to come here. And I can't forget to thank you for the lovely comments some of you make. They truly make my day. So if you want to give me a birthday present, feel free to comment below or hit the follow button if you haven't already. It'll be the best present ever! Just letting you know I've got some new things coming up for this blog this year. Ooh exciting. And I'm looking for a better way to converse with you guys (I'm thinking maybe Disqus?) Keep me posted about any ideas you might have. They'll be much appreciated.